Blue Latin Palm or Latania Palm is truly a majestic palm with stiff and captivating blue fan foliage. 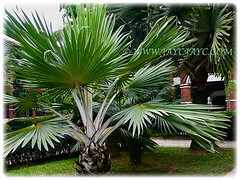 A handsome palm that is considered as one of the best ornamental fan palms. Latania loddigesi is listed as a threatened palm in the IUCN Red List. Botanical Name: Latania loddigesii (syn. : Cleophora loddigesii, Latania glaucophylla). 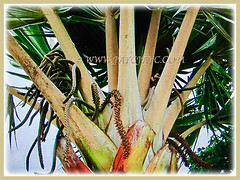 Common Name: Blue Latan Palm, Latan Palm, Blue Latania Palm. Origin: Native to Mascarene Islands comprising Mauritius, Rodrigues and Reunion. Plant type: An ornamental and perennial fan palm. Features: Latania loddigesii is from the genus Latania that consists of three species of flowering plants. A solitary, erect and slow-growing palm that will eventually reach 10 m in height. Its 25 cm wide trunk has thick and swollen bases. It bulges at its base with irregular and slightly raised leaf scar rings on a dark grayish background. It is noted for its distinctive and coarse-textured costapalmate leaves. 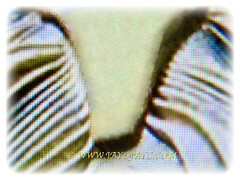 Each leaf is up to 3 m wide and divided into stiff, single-fold segments about ? to ½ the length of the leaf blade with undivided leaf segment tips. The leaf color is a pale waxy blue to blue-green with dense, whitish and wooly tomentum, giving a silvery appearance to the palm. The leaf sheath splits to form a V-shape below the petiole. The large, leathery, very thick and stiff leaves, up to 2.44 m in diameter are held upwards on 1.52 m long petioles. The petiole is smooth and sharp-edged or armed with minute teeth along the margin near its base and with a triangular or arrow-shaped hastula. The petiole is slightly reddish in colour when the plant is young. The 0.91 to 1.83 m long flower stalks are present among the leaves. 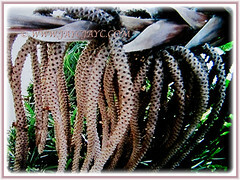 Inflorescences are laterally to dependently oriented with 1 m long yellowish staminate (male) and 2 m long pistillate (female) flowers growing on separate palms. The glossy, fleshy and oblong fruits up to 2.5 cm wide and 7.5 cm long are greenish to brownish-yellow in colour when ripe. 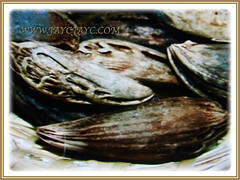 The fruits have a textured surface and enclose the smooth and almond-shaped seeds in sculpted pyrenes. 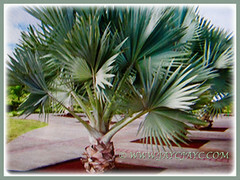 It is a relative of the Bismarckia Palm which looks quite similar to this Blue Latania Palm. 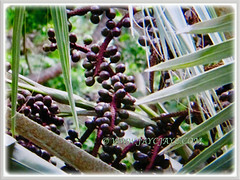 Culture (Care): Latania loddigesii or Blue Latan Palm can be grown easily with least maintenance. Soil: Humus-enriched, loamy and well-drained soils, though adaptable to a wide variety of soil types, provided its’s well-drained. It is moderately salt tolerant. Others: This majestic palm does not require any pruning. Just remove the withered fronds to keep it aesthetically pleasing. 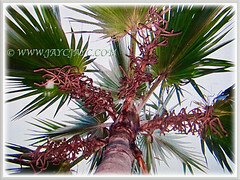 Use a good quality palm fertilizer which contains the correct ratio of nutrients twice annually. Alternately, use a slow-release granular fertiliser. 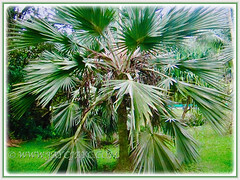 Generally, the Blue Latan Palm is free from serious diseases and pests. However, it is susceptible to lethal yellowing disease. Latania loddigesii or Blue Latan Palm will thrive in a full sun location in most tropical and frost-free subtropical areas. It can tolerate a minimum temperature down to -3.89°C or -0.55°C. For non-hardy regions, it is advisable to plant this impressive palm in a container so that you can easily bring it indoors before any frost threatens. Propagation: Easily propagated from seeds that take about 2 months to germinate. Usage: Latania loddigesii or Blue Latan Palm will be excellent as a striking specimen tree in parks and gardens. 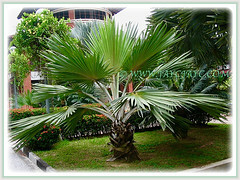 A dramatic palm tree that’s most suited for landscaping along highway median strips, roundabouts and along road shoulders. Ideal too as a container plant for a sunny deck or patio.